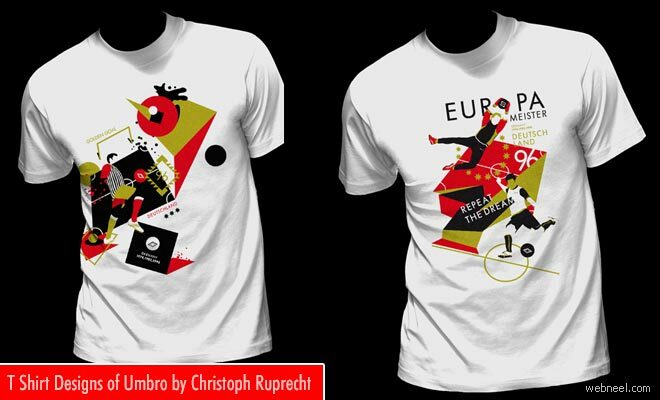 T Shirt Designs : Christoph Ruprecht is a German artist based in Karlsruhe. He has his own unique style, mostly abstract and rich graphical elements mixed together. Christoph is best known with his pseudonym "crispycrystal". Being a design generalist he is interested in timeless beauty of the classical with the expansive nature of the avantgarde. His tshirt designs for the brand Umbro are all a visual treat. All the designs are created as to work either with 3 or 1 colour print. The tshirt design created for Umbro basically with the golden goal as the idea behind has a wide reach among the customers. The timeless geometric forms and balanced visual composition of christoph's work crafted bauhaus look to the tshirt designs.